Well, a little bit. At least for the products of Sekaya, I’m a convert. 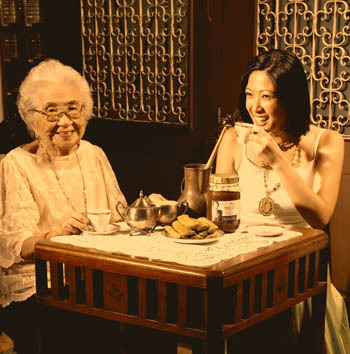 I was introduced to the brand by Claire de Leon Papa, Communications Director of Unilab, when she approached me to recommend a pastry chef who could create cookies or scones using their teas. Sweet Sally Desserts, of course, was top of mind since it was close to home (by Goldee Salcedo) and over the holidays I was so happy to be the guinea pig to test such creations as Earl Grey brownie bites or Green Tea banana bread. Last week, though, Sekaya went a step further for their official launch when they approached Chef Wilson Cariaga of Tagaytay Highlands who created a full menu inspired by the teas. Chef Wilson, previously at Four Seasons Maldives, did both savoury and sweet creations! I loved that he created a rub using Sekaya’s Pu-Ehr Tea which he used on chicken skewers. He also poached salmon in Pu-ehr tea. As for the sweets, I loved everything that he created with the Earl Grey tea. You don’t taste it right away but it will hit you a few seconds after digging in, then the taste lingers. Love that! He used Earl Grey for his almond and walnut cookies, orange pound cake and chocolate truffles (yum!). Mango Summer tea was used by Chef Wilson for a panda cotta, pavlova and creme brûlée; and Hibiscus tea was used to create a syrup for a yogurt parfait. Orange pound cake using Sekaya’s Earl Grey botanic infusion. But more than the added dimension to flavours that the tea gives you, I was informed by Judy Abrina, Marketing Manager of Sekaya, of the many health benefits that botanic infusions give you! She also explained to me the difference between teas and botanic infusions. :if the leaves are not from the evergreen shrub species Camellia Synensis, which produces teas like chamomile, jasmine and the like, it is technically not tea but tisane (herbal tea). Both tea and tisanes, however, are considered botanical infusions, hence the terminology by the brand Sekaya. Judy Abrina, Marketing Manager, Sekaya, tells us about tea as key to wellness. I was also happy to note that Sekaya, though foreign-sounding, is a purely local brand, created by pharmaceutical Unilab. “Since Unilab is focused on the healthcare of the Filipino, it was decided that it is time that we also come up with natural products that will respond to compliment that vision,” Abrina explained. I confess that I am not a tea drinker. I am part of the Starbucks generation obsessed with coffee. As creator of the Nana Meng Tsokolate brand, I am also into chocolate. But maybe, as we grow older *gulp* it’s time to reconsider our drinks and switch to tea! The wellness benefits seem to be abundant! Sekaya is available online at sekaya.com.ph. So Sekaya has studied botanical infusions (teas and tisanes) for specific wellness purposes.